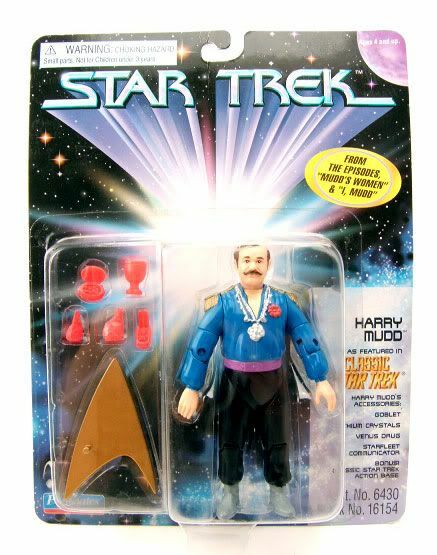 Harry was released on what I like to call the 'Unified' Star Trek cardback, when playmates decided to consolidate all their different Trek lines into one. Rundown: Ah, Harry Mudd, why do you rule so much? Quick confession- Harry Mudd is one of my all-time favorite 'villains' (it's tough to call ol' Harry a villain... he just trying to make a buck!) in ANY medium. 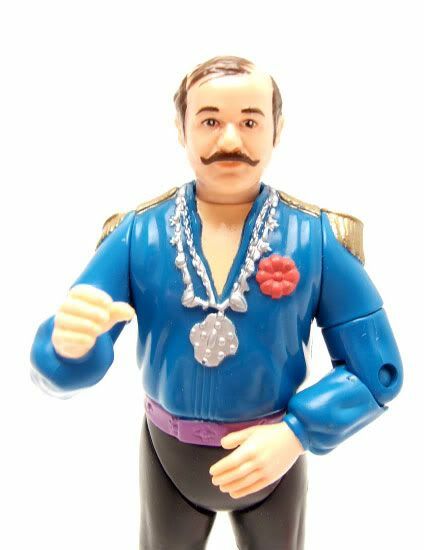 Portrayed to perfection by Roger C. Carmel, Harry stands out for being a truly fun to watch nemesis for Kirk and the crew. 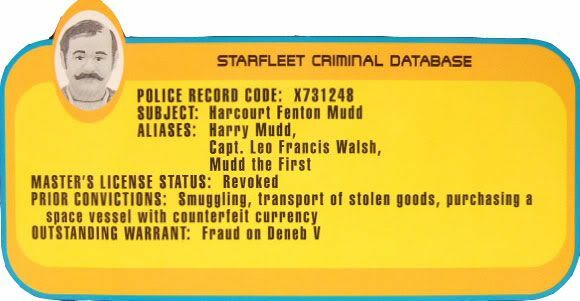 Fun fact- Harry is the only 'villain' in Classic Star Trek to appear in more than one episode of The Original Series ("Mudd's Women" and "I, Mudd"). His 2 episodes (and for that matter, his animated epsiode) are some of my favs in the entire run...thus why I picked him for the very first spotlight! Harry here is sculpted in his attire from "I, Mudd", his second appearance. Playmates nailed this sculpt! Everything is picture perfect, from his wispy hair to his blue, Napoleon-Esque shirt! 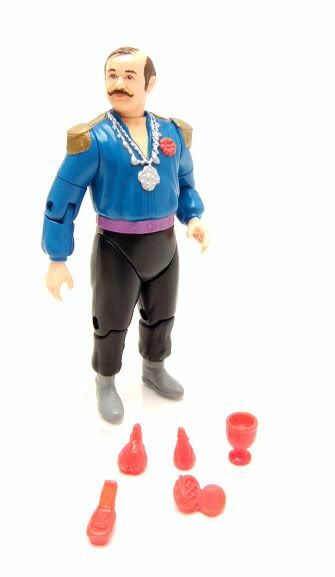 This is the only Harry Mudd figure ever made (as of this writing) so thankfully Playmates put some real effort into making him look sharp. I am personally glad they chose Harry's second appearance to base the figure's look on. While the first appearance outfit is great, the second outfit seems to fit the eccentric character alot more. As far as accessories go, Playmates decided to choose accessories mostly from Harry's first episode, "Mudd's Women". Harry comes with the Venus Drug he used to turn Eve and the other ladies into beauties, 2 Lithium Crystals (presumably taken by Kirk when Harry's plans fell through), and the communicator he used to contact the miners. 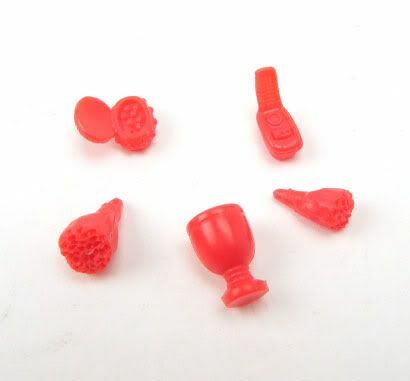 Harry also comes with a Goblet, which is the only accessory of the bunch from the epsiode "I, Mudd" on which the figure's attire is based. Why the decision to include accessories from the first episode instead of the second? Well, there's not alot of choices from his second appearance. There's the goblet...and um, that's about it. Maybe one of the necklaces used on the androids, but Harry doesn't actual hold one and you'd have no android to put it on. So, kudos to Playmates for not just throwing a phaser or something in there. Labels: Harry Mudd, Playmates, Playmates 4.5"